We are on south Dartmoor here, near the vast and ancient granite quarry of Merrivale. 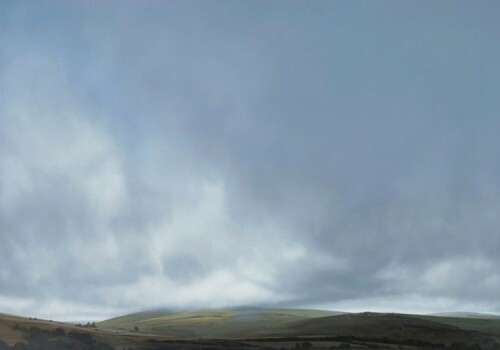 The central rise in this softly female and undulating moorland curves up to the lowering sky, and the vast roiling tumble of clouds reaches down to perch upon it. This is a contemporary take, perhaps, on the myth of Danaë, who was wooed by Zeus in the form of a shower of gold. The shower here is indescribably softer and more English, full of the subtle earth tones of fields, trees, hedges and hillsides, and the mild damp breath of the clouds. Pagan and pantheistic, it is the ultimate expression of poem by – say – Wordsworth.